Combining a spectacularly potent Haze like Super Silver Haze with the equally spectacular taste of the popular Blueberry obviously should result in something truly extraordinary. This is exactly what Zambeza did to make their Blue Brilliant and we can tell you right away that the result is mind blowing. Get ready for a super-aromatic, fruity and smooth taste with the sensational high from the SSH! Blue Brilliant Bulk Seeds: Famed Super Silver Haze Now With The Great Blueberry Flavour! Zambeza did an outright brilliant job when they created their Blue Brilliant. The legendary Super Silver Haze genetics give the already excellent Blueberry a nice kick of potency, giving us a Sativa that shines with the unmatched high from the SSH and the no-less-amazing flavour from her Blueberry side. Some Haze strains out there can at times really demand a lot of patience from the grower. Flowering times of 11 weeks for growing some good Haze bud are not out of the ordinary. 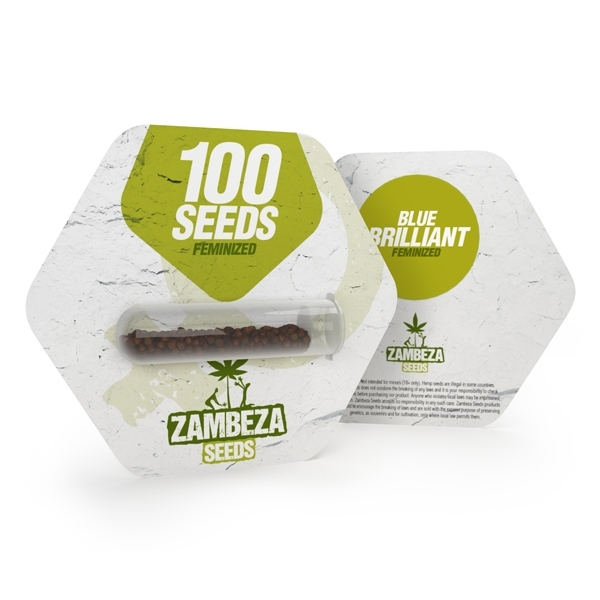 Zambeza’s Blue Brilliant however, delights with a relatively short flowering time of 65 days which is remarkable for a top-quality Haze. With an average height of only 80-110cm when grown indoors, Blue Brilliant stays very manageable which makes her well-suited for any size of growing tent or greenhouse. Her respectable yields of up to 600g/m² don’t leave a wish there open either. If you grow her outdoors, Blue Brilliant can get somewhat taller due to her stretch, up to 180cm with about the same yields. When smoked, Blue Brilliant shines with the same trademark smoothness that you may perhaps already know and love from the original SSH. Blue Brilliant makes this already superb smoke experience even better by adding the fresh, sweet and fruity flavour notes of the Blueberry but keeping the same awesome smooth smoke. She delivers a very strong but clear and focused high that is very uplifting. She’ll give you a nice boost of creativity and happiness, just the right smoke for during the day that can give you entire new insights into all sorts of things like the arts, music or philosophy. Her 20% of THC ensure a potent and happy high that only a first-class Haze can deliver. Blue Brilliant combines two extraordinary strains into one fabulous Haze hybrid that is extremely satisfying. With her amazing taste and the unsurpassed Haze high, we wouldn’t be surprised one bit if she becomes a favourite for Haze lovers everywhere. If you need more seeds of a truly fantastic Haze, Blue Brilliant bulk seeds available in packs of 100 seeds will be a perfect choice!